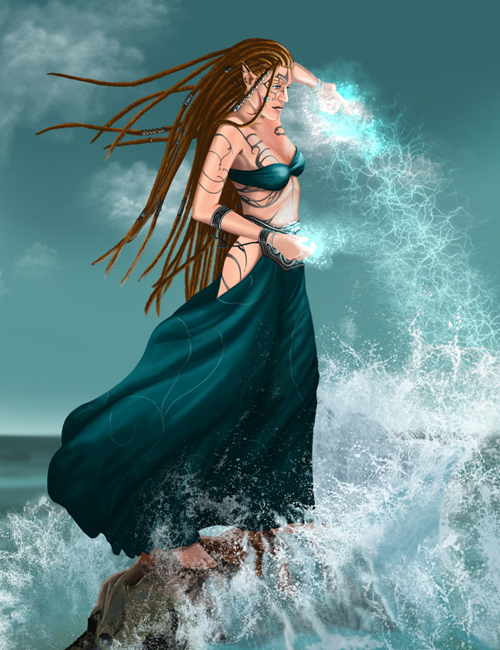 The piece I chose today is Aphria, a Saor Sidhe (witch) using her water magic. My focus for Aphria was to show the distinct appearance of the Sidhe and the difference in the tattoo styles of the Saor verses the Cym. She uses the elements of Water, Air, and Empyrean with her strongest being that of Water. Aphria has recently been accepted by the Cym after being run off by her own people for trying to work on peace between the northern Saor and the Gjåles. In Cym society she has been entrusted to continue trying to work with the Gjålestadt though only by direct order of the Thane.